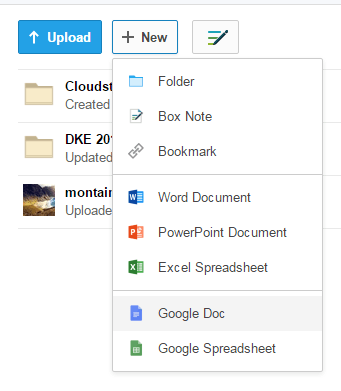 Integration with Office, Google Docs, etc. 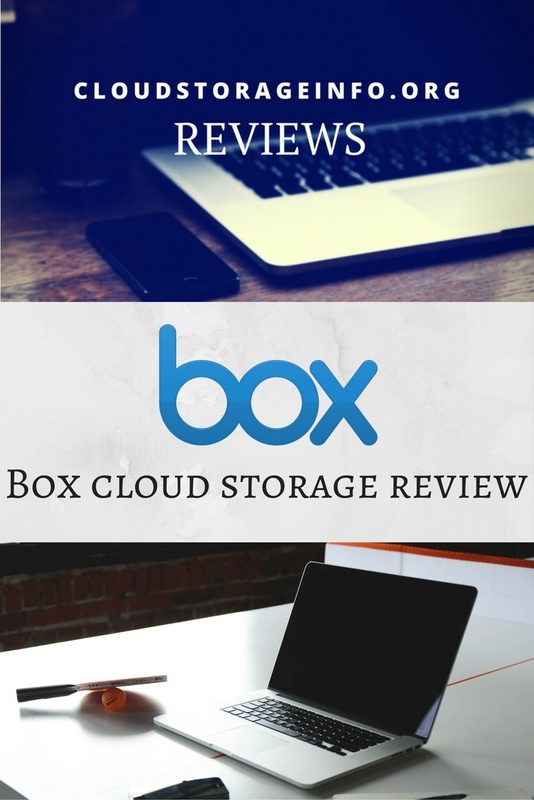 Box cloud storage review in a few words: "This is a perfect cloud storage for users that need up to 10 GB of storage." Box is a cloud storage, known more in the business world. While uncompetitive in prices, when talking about personal usage, it offers a lot of features that you can benefit from. It also provides a free 10 GB storage for anyone who decides to join. The overall quality of the service is very good. The integration between various other programs like Office, Google Documents, etc. is excellent. There are no backup features included. Read more about Box down below. I think it's the best if I say it from the start. Box, as a cloud service is meant more for business companies, but you can sign up as a personal user as well. You can still get that free 10 GB and if that's enough for you, great! When compared to other services Box doesn't match them. Their personal plans seem a bit out of date and rather expensive. Here's the chart. Box Personal Free 10 GB Box Personal is free to use for an unlimited time. It comes with almost all the features that are available in the Box. Box Personal Pro $11.50 / month 100 GB Comes with additional features like increased storage, file limit and file versioning. Here're some of the features comparisons between the two plans. There are some other minor differences to it as well. This service is more suitable for business owners, but can be used for personal use as well. If you want to have a lot of features at your disposal, quality cloud storage to which you can store your files, ability to share your files and sync them across all your devices, then this is for you. Keep in mind that you can get up to 100 GB only by upgrading to the Pro plan. Box is rather easy to use if you want only to upload your files and keep them there. There are a lot of additional features that need to be examined more thoroughly before using them. The interface itself looks modern and easy to navigate through. There are some other options under some small buttons, which you have to find once and then you know they're there. 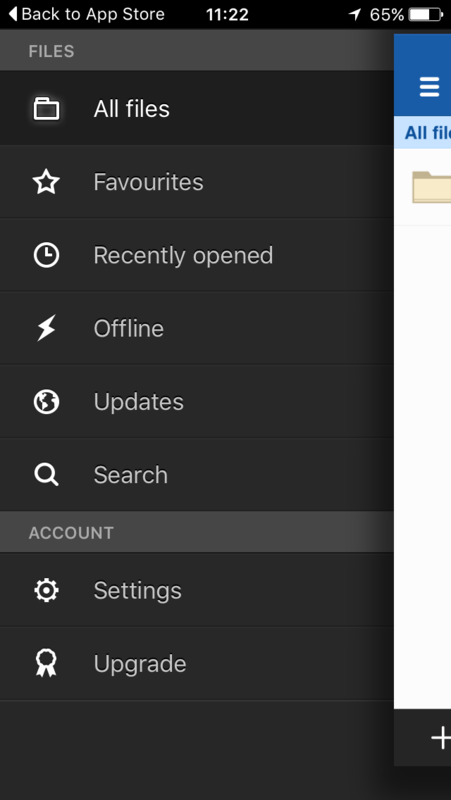 Apart from that it just looks nice and gives you a feeling that you're using a professional cloud service. It's simple and straightforward. One thing that I noticed is that it feels a bit slow sometimes and unresponsive. You can also check your connection to Box through their diagnostic program. When I ran the program, I achieved nearly the maximum speeds that my provider offers, which is good. Box Sync is a desktop version of Box. It allows you to have a virtual drive right in your library. Once you install it, it's easy to use. It becomes just another drive to which you can store your files. If you go to Box in your browser, you can decide which files would you like to have synced with your desktop and mobile application. By default, all files are synced, apart from folders which you have to enable manually. 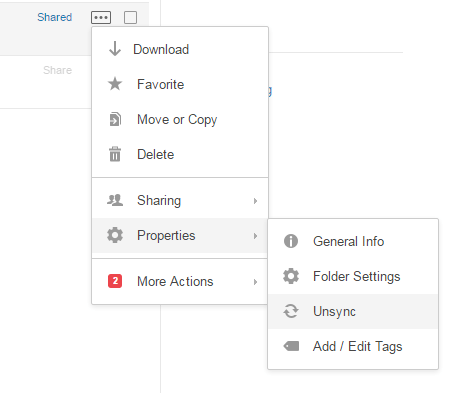 While in Box Sync (desktop application) - If you need to share any of the files you just right-click on them and select the "copy link" or "e-mail link". 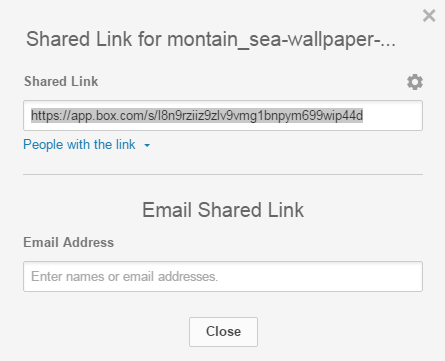 If you choose the first, it copies the sharing link of that file to your clipboard. 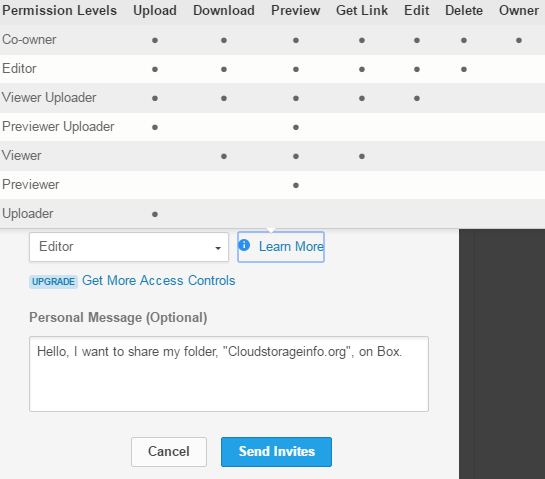 You can also invite other people and give them access to your folders and files with different permissions. 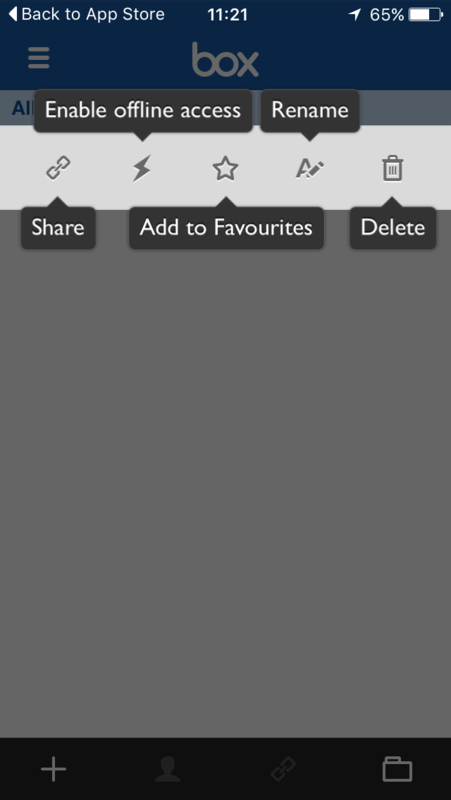 If you're using browser version, you just click on the "share" button. It brings up some additional options, but what it essentially does is, it provides you with a link that you can then share forward. You can recover your deleted files within 30 days of deletion. After that, they're permanently removed. Moderators can only change this in business and enterprise plans. File versioning, on the other hand, isn't available to all users. This feature can be used by Pro users only. It automatically saves up to 10 previous version of the file you're editing. This can prove to be very useful, especially if you're a baboon like me and are likely to mess something up. Box was the first of the cloud storages to create a new level of content management security that uses access controls that are role-based. This means that you can enjoy uptime 99.9 percent of the time guaranteed and benefit from high-grade SSL encryption. You can be carefree when uploading your files to Box. Now, this is a topic that I've been looking forward to. 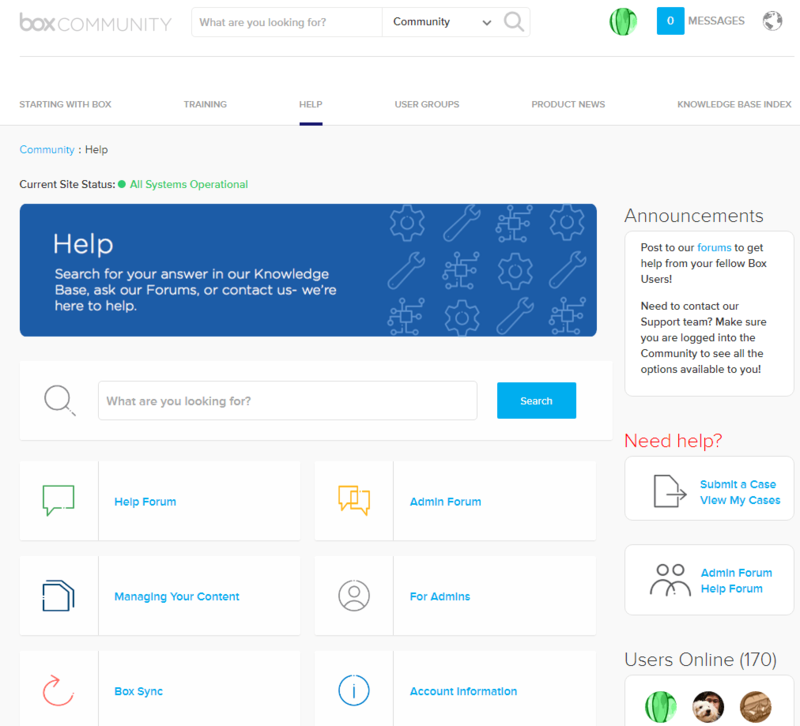 I believe Box as a cloud storage has one of the biggest forum communities. There's usually a couple of hundred of people online at all times, and the forums itself are filled with all the information you need. If only that wouldn't be enough. They provide live chat support during their working hours. You just send a message and a staff member comes by in a few minutes, and from that point forward you just continue the discussion about the problem. If you send a message while non-working hours they reply the next day through e-mail. When I contacted them, they had the answers to almost all of the questions. You can create a Word or any other document directly through Box on the website itself. How awesome is that? Then you just save it to any folder and continue next time, wherever you are. There are a lot of 3rd party programs as well, made by various companies, which you can use. To see the full scale of this applications and to see if you would be interested in any of them click here. Box offers their official app both for iOS and Android. It enables you to manage your files wherever you are. You can also access them offline if you save them manually. Despite some negative reviews on the app store, I haven't run into any troubles so far. The application feels very responsive and straightforward to use. Here's how it looks. Box is one of those "get what you pay for" services. Despite its uncompetitive prices (Personal Pro plan), there are so many features that come with it. If you're looking for a business storage, though, this is one of the better options to pick from. I will be doing a separate review on Box Business service since there's a lot to cover. 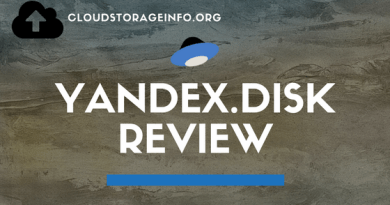 Hopefully, we've gone through everything in this Box cloud storage review. If you're looking for a cloud storage and don't need much space, but enjoy the additional features that come with it, this is the choice for you. YOUR OPINION MATTERS! Review Box yourself as well by posting a comment below. Would you just like to share or ask something ? Just skip the review part! ← Dropbox Paper App Has Been Released For iOS And Android Users. I have always been afraid to use cloud storage because I was afraid that it would be a public source that other people could access. So I stick to my flash drives, but after reading this I see that it is safe and secure. Do you recommend the pro account for someone that takes a lot of pictures on their phone and has them automatically synced? Thank you for stopping by. Box is one of those cloud storages that would be so much better if they focused on making their service more approachable to personal users. However, they decided to make their service more suitable for companies. If you’re a personal user I would advise you to look at some cheaper and better alternatives such as PCloud. Very clear review – thank you for all the screen grabs, made it much clearer. I like your recommendation of the online support forums (often missing in these deals). Great food for thought! I have been looking more and more into this cloud storage stuff as it seems to be getting more popular. I had not thought of a lot of the benefits you explained here, especially syncing with various devices. Up until this point I had just been using and carrying a flash drive with me. This seems like it would do just fine to replace that ain’t? Hopefully, this review was helpful to you. If you need any additional information you can read more about it – Cloud storage definition or Cloud storage facts and features. Cloud storage can and will easily replace the need of carrying a flash drive with you.